Did you know that the national sport of Canada is not ice hockey, but lacrosse? I personally was very surprised by that! Ice hockey is the national winter sport! But it´s definitely playing a more important role for Canadians. Probably because of the long winters with lots of snow. 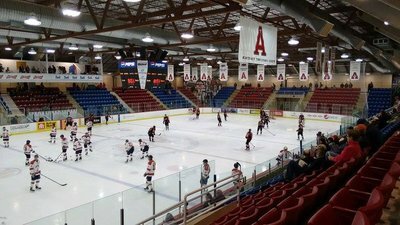 Last weekend I went to a hockey game with my host family at Acadia university. By the way, I LOVE Canadian high school and university sport teams! The whole school is cheering on them and a big hockey game is actually a big event for most of the students. In Germany people barely join the school team, the really good people play in the local teams. Accordingly our school spirit is nothing in comparison to what you usually have in Canada. Ice hockey is fast and elegant and action packed and I LOVE IT! I really don´t understand why we´re always watching boring soccer games in Germany. I can hardly believe it - my adventure in Canada is almost over! I´m leaving at the end of this week. I am certainly gonna miss the every day life here. 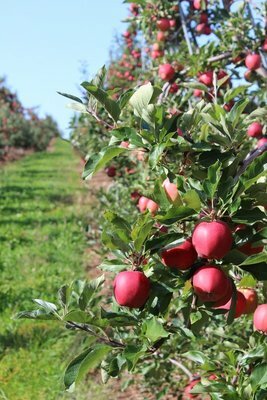 I´m living in Shelburne, a small community in the south of Nova Scotia. Because there are only about 1800 people living in the actual town, everybody knows everyone or at least a friend of yours. This is, especially as an international, a great experience - everybody is curious about your country and your experience in Canada. In my last months several people just started talking to me while I was walking through the town. IF I actually met people on the road - almost everybody is driving. I don´t want to say Canadians are lazy, but in relation to walking they definitely are. I have to admit that school bores me sometimes, a lot more than in Germany. For me, always comparing everything to how it is in Germany, teachers in Canada have very low requirements and explain everything several times. And even if you ask after all the explaining exactly the same thing they just explained nobody taunts you for that. Canadian teachers want you to have good marks and to pass their course. They really care! I´m definitely gonna miss open book tests back in Germany ! Last weekend I went to the NSSSA leadership conference in Liverpool. It was a unique experience, I really can´t compare it to anything I did before. We talked about self-confidence, about working together in a team, about different topics like mental health or global population and between and also during all the skill-building sessions and workshops we had tons of fun! The whole conference is solely organized by students. They´re asking for sponsors, buying the food, cooking the food, planning the program and advertising the conference. They did an awesome job, I really want to go there again.. I probably can´t, unfortunately. Yesterday we had a Remembrance Day ceremony at school. I sang with the choir - which consists only of three people - in front of the whole school. I was really afraid before, especially because these kind of songs are always so high! But once I was singing the stage fright was gone and I could enjoy it. Other students talked about the two world wars, the wars in Korea and Afghanistan and also about peacekeeping forces. Veterans, politicians and the cadets were there as special guests. We watched a video about the trip a couple of students and teachers made to Europe last year. They visited important places like the concentration camp in Sachsenhausen, Germany´s capital Berlin and the Anne Frank house. The pictures made me even more emotional because I have seen a lot of this places by myself. Earlier this year I went to the Dachau concentration camp. I spent a lot of time with research for a presentation I had to do for school. It actually is one of the most famous concentration camps in Europe, basically because it was one of the first camps in Germany and 12 years continuously in operation. It wasn´t an extermination camp like Auschwitz where at least 1.1 million prisoners were gassed, thereof 90 percent Jewish. Dachau was mainly for political prisoners, this could be anybody who said or apparently said something against the Nazi system. Around 42000 prisoners died, although the camp was supposed to be a work camp. The speakers at the ceremony brought the feelings back I had when I visited this terrible place. They talked about how they thought they would be prepared because they had read the book and they had seen the movies. But nothing prepares you for that. Today I went to the ceremony in my town where approximately the same happened. In the beginning, the band played "Oh Canada", in the end "God save the Queen" and in between they read out the Act of Remembrance and we had a moment of silence. I really enjoyed the atmosphere and hope I´ll experience another Remembrance Day over the next years. In Canada Halloween starts as soon as fall is there. People carve pumpkins, buy their costumes, decorate their gardens with fake graves and buy tons of candy. Even though I went trick or treating for years, this Halloween will definitely be the one I remember the most. The streets were almost crowded by kids who partly wore very creative and funny costumes - I loved it, even young people went door to door. AND it´s worth it! We came back with innumerable packages of chips, maaany chocolate bars and other, for me, indefinable candy. The whole Halloween week there were activities in my high school. I participated in a pumpkin carving contest with my friend Noémie and we actually carved the second best pumpkin, we named it Bruno (left). 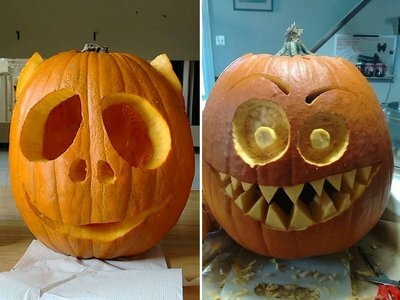 After that I carved Carl (right) at home. I´m very proud of us! Thanksgiving is celebrated the second Monday of October in Canada, as opposed to the States where it is at the end of November. The 12th of October was a Monday and therefore we had a long weekend and used this opportunity to visit two of my host parent´s children. Although it is only October everybody is already in "Halloween fever". The whole city of Kentville was decorated with pumpkin people - it was a huge contest and everybody had the opportunity to participate. We had a lot of fun posing with pumpkin simpsons, pumpkin astronauts and pumpkin pirates. I´ve never seen such an awesome thing in Europe. As soon as you´re older than ten you just don´t care about Halloween anymore. I really think you North Americans are better in celebrating! In the evening we had our Thanksgiving dinner. I´d love to say I tried turkey and it was delicious but actually I´m a vegetarian so my Thanksgiving food wasn´t very typical. I had squash, pumpkin and apple pie, though! Also it was a nice evening with the family. Check out my gallery to see some more expression of my adventure in Canada! I´m now here for one month, that´s a third of my time here. The time has passed sooo fast! I´m already sad when I think about going home again. Every day I experience another incredible thing in Nova Scotia! The picture above was taken in the Island Park near to Shelburne. We still have nice weather so my friends and I really enjoy hanging out there. On Thursday I had my first school dance - first I was really excited, then I was disappointed because none of my friends wanted to go there, but in the end it was a very nice evening! Many Canadian students at any age went there and they even danced, I expected only junior students and the internationals. Nobody in my age would do this in Germany - another plus point for Canadian high schools. It´s not only studying, it´s fun as well! This weekend we visited my host parent´s son James in Fredericton, the capital of New Brunswick. We drove about seven hours, but in the end it looks like a few inches on a map of Canada - that´s crazy! In seven hours you can cross Germany. We´re apparently very small for you . The first day we went shopping and the second day we went shopping again. Apart from this very important activity we also had dinner in the best Italian restaurant ever and spent a lot of time with James little daughter Emiline who is adorable. Before we went to the big, big shopping mall on the second day, we were at the Farmer´s Market where we drank a delicious blueberry banana smoothie and where I also found real pretzels (Bretzel in german). The ones you can buy for nearly four dollars at the "Pretzelmaker" are just ridiculous. They taste like butter croissant, not like a Bretzel. This day I also tried Taco Bell which I really don´t like, unfortunately. I have to admit I´m a little bit disappointed. Tim Horton´s where I went to at my first day in Canada surprised me in a positive way so I guess my expectations were too high. Don´t forget to check out my photo gallery where you can find more photos of the shopping mall and with my host parents! 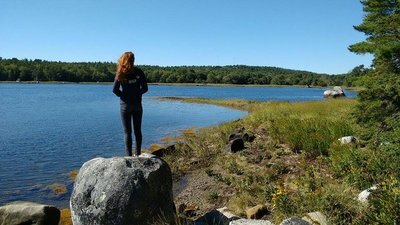 Peggy´s Cove & Halifax in one day!